هدف این تحقیق تحلیل عوامل بازدارنده جنبش نرم‌افزاری در نظام آموزش‌‌عالی کشاورزی و منابع ‌طبیعی از دیدگاه دانشجویان تحصیلات تکمیلی پردیس کشاورزی و منابع‌طبیعی دانشگاه تهران بود که حجم نمونه با استفاده از فرمول کوکران به تعداد 124 نفر تعیین و از طریق نمونه‌گیری طبقه‌ای با انتساب متناسب انتخاب شدند. یافته‌های تحقیق نشان داد که از مجموع سازه‌های بازدارنده، به‌ترتیب «مصرف نامناسب بودجه تحقیقاتی در دانشگاه»، «تأکید نشدن بر موضوع آموزش مطالب به‌صورت عملی و تجربی» و «نبود ساماندهی و جهت‌دهی تلاشهای پژوهشی محققان دانشگاهی در راستای حل مسائل کشور» در بالاترین اولویتها قرار دارند. 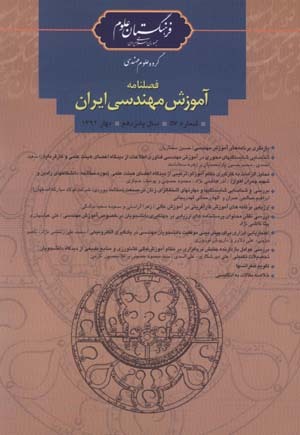 همچنین، بر اساس نتایج تحلیل عاملی، شش عامل محدودیتهای زیرساختی ـ نهاده‌ای، مشکلات ارتباطی و اطلاعاتی، ضعف در فناوری اطلاعات و ارتباطات، تنگناهای فرصتهای مبادله‌ علمی، تنگناهای نهادی ـ مدیریتی و مسائل انگیزشی در مجموع حدود 971/63 درصد از واریانس کل سازه‌های بازدارنده را تبیین کردند. 1Ph.D. Student of Agricultural Education, University of Tehran, Karaj, Iran. 4Ph.D. Student of Agricultural Extension, Shiraz University, Shiraz, Iran. The objective of this descriptive- survey research is to analyze inhibiting factors of software movement in agricultural and natural resources higher education. The statistical population of the study consisted of the graduate students of University College of Agriculture and Natural Resources, University of Tehran, out of which 124 people were selected as sample, using proportionate stratified sampling technique. Results of prioritizing showed that from all inhibiting factors of software movement in agriculture and natural resources higher education, the top three most important inhibiting factors (in order of importance) were “inappropriate use of academic research budget”, “not paying attention to practical and experiential education” and “not organizing and directing research attempts of academic researchers in order to solve the country's problems”. Also results of factor analysis revealed that six factors explained about 63.971 percent of variations of inhibiting factors of software movement in agricultural and natural resources higher education: infrastructural-input restrictions, informational and communicational problems, weakness in IT, obstacles in scientific exchange, institutional-management obstacles and motivation issues.